M@ Return of the Tox? If they ever create a graffiti Hall of Fame, one of the first inductees will surely be the mysterious figure known as Tox. He’s been spamming the London rail infrastructure with his tag for years. That was until last year, when he seems to have rethought his errant ways after having an ASBO slapped on him (why are ASBOs always slapped?). But a recent sighting of his work suggests he may be up to his old tricks. So has he come out of retirement? Anyone using public transport, particularly to the north-west of London, can't help but notice the ubiquity of his tag: the simple yet winning formula of spraying 'Tox' followed by the last two numbers of the year. Genius! There’s no art or grace to it, in fact, his graffiti is rubbish by any standards. It’s just the sheer quantity that’s won him fame. While the Londonist doesn't condone rail vandalism, you have to applaud his work ethic. 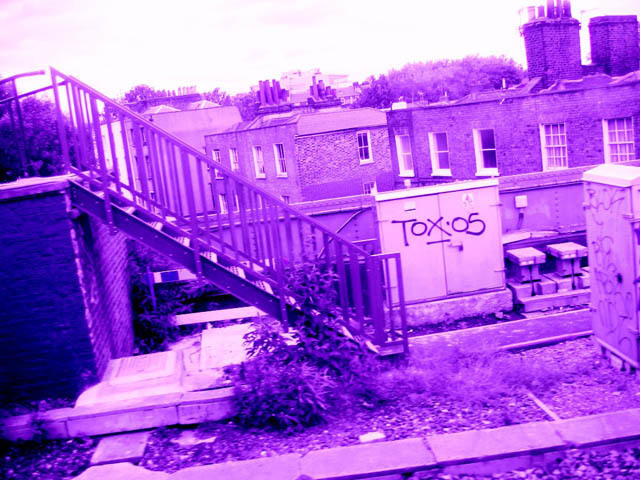 There are almost as many Tox tags along London's railway lines as there are signal failures. The heyday came in 2003, when ‘Tox03’ covered every available inch of the Metropolitan line, sometimes in places so inaccessible as to suggest he’s the rather unlikely lovechild of multiarmed Vishnu and Mr Tickle. As one cognoscente of the art form put it “i aint a big fan of tox but give him props cos he is up everywere kist smacks it das you know anything about zelda gettin shift?” High praise indeed…we think. Have you spotted any Tox05 tags? Let us know by replying to this post using the comments form.